an assistive device that provides partial support and balance for ambulation and standing. Cane. 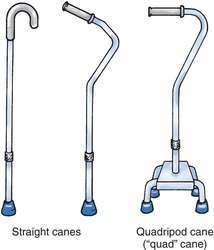 A and B, adjustable canes. C, quadripod (quad) cane. adjustable cane a cane whose length can be easily altered. quadripod cane a cane adapted for increased stability by providing a four-legged rectangular base of support. tripod cane one similar to a quadripod cane except that its base is triangular with three legs. white cane a cane used by the visually handicapped to increase awareness of the immediate environment; the white color is a sign to others that the user is blind. A stick used as an aid in walking or carried as an accessory. a sturdy wooden or metal shaft or walking stick used to give support and mobility during walking to a person with impaired mobility. A cane should be of an appropriate length to allow a person with an injured leg to walk with it held on the side of the noninjured leg. In walking, the person may rest his or her weight on the cane and the injured leg while moving the unaffected leg forward. To take the next step, the weight is placed on the sound leg while the injured leg and cane are moved forward. The cane should allow 25 degrees of elbow flexion. An assistive device prescribed to provide support during ambulation and transfers for individuals with weakness, instability, pain, or balance loss. It also may be used to unload a lower extremity joint or to partially eliminate weight-bearing. 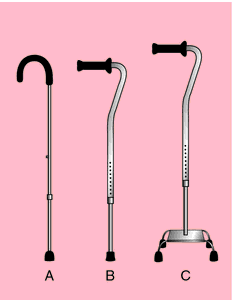 Standard (conventional) canes are made from wood or aluminum and have a variety of hand grip styles. Other styles include tripod canes, quadruped (quad) canes, and walk (“hemi”) canes. Canes should be used on the unaffected (stronger) side of the body.